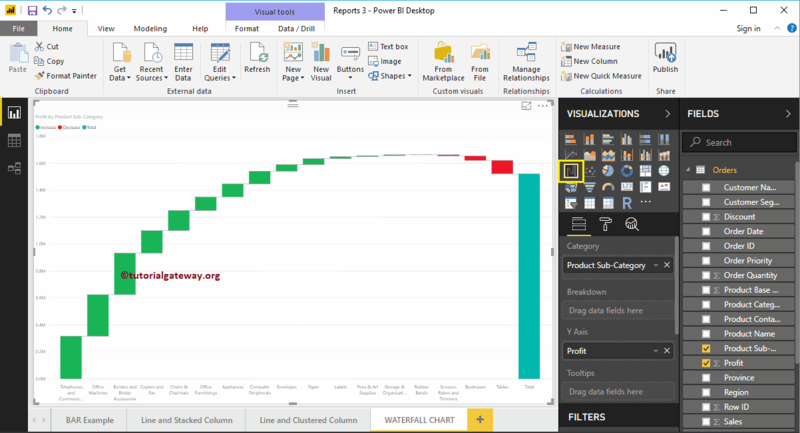 Power BI Waterfall Chart is very useful to visualize the Sales or Profit over a period of time. 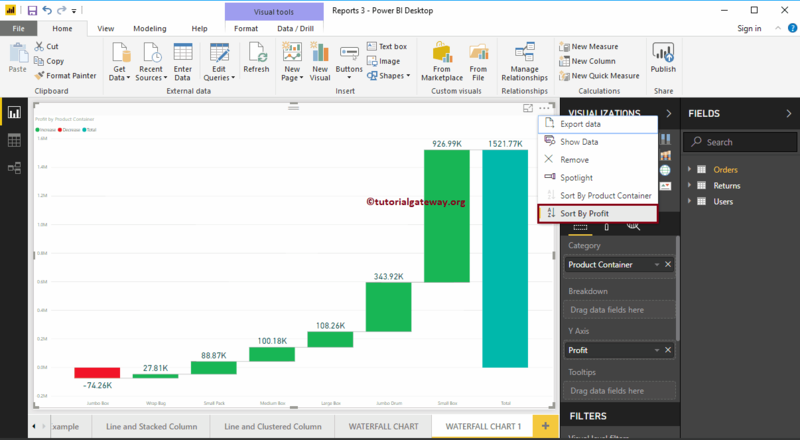 In this article we will show you, How to Create a Waterfall Chart in Power BI with example. 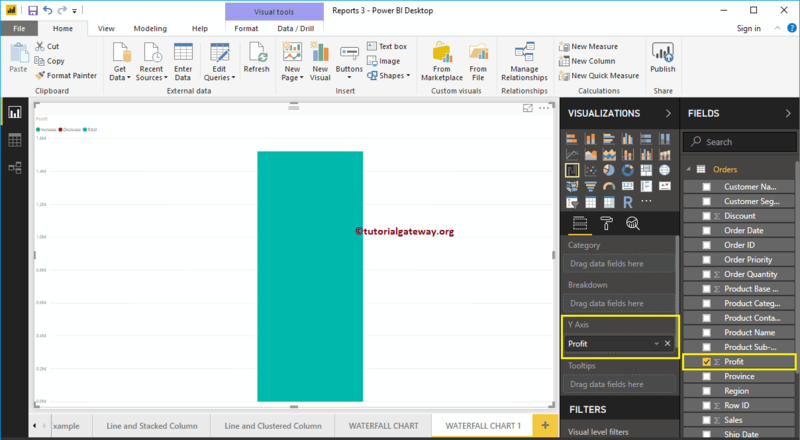 For this Power BI Waterfall Chart demonstration we are going to use Excel Data Source that we created in our previous article. 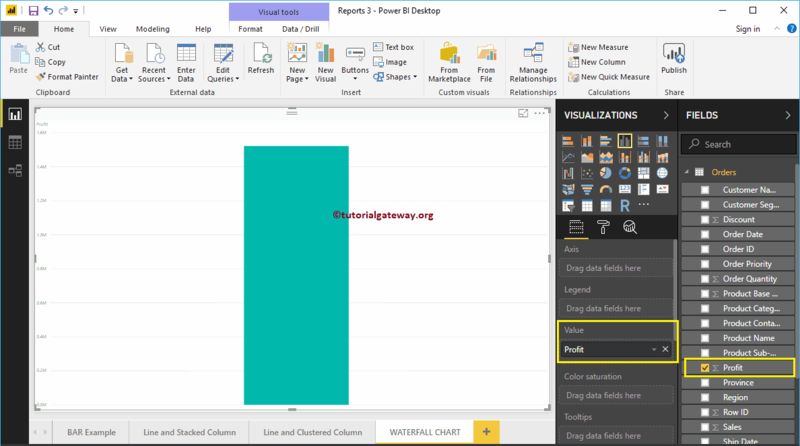 So, Please refer Connect Power BI to Excel Multiple Excel Sheets article to understand the Data Source. 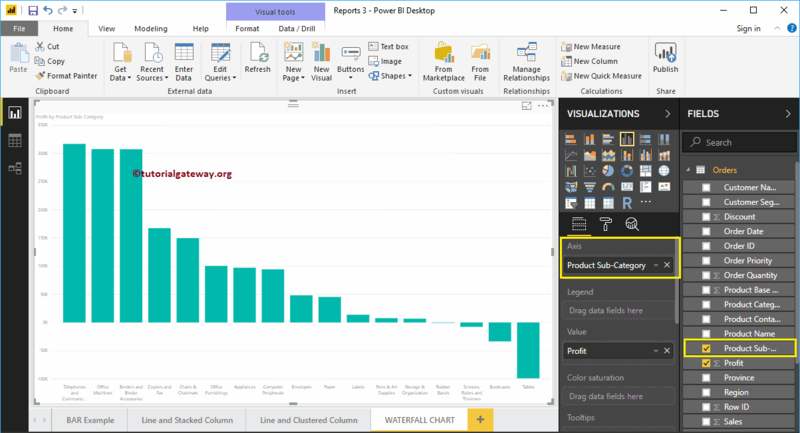 In order to create a Waterfall Chart in Power BI, first, Drag and Drop the Profit from Fields section to Canvas region. This will automatically create a Column Chart as we shown in below. Let me add the Product Sub-Category to the Axis section. 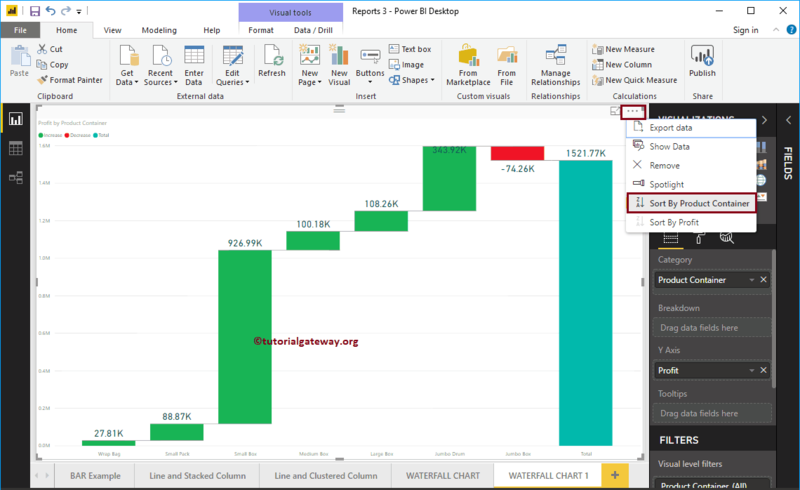 Click on the Waterfall Chart under the Visualization section. 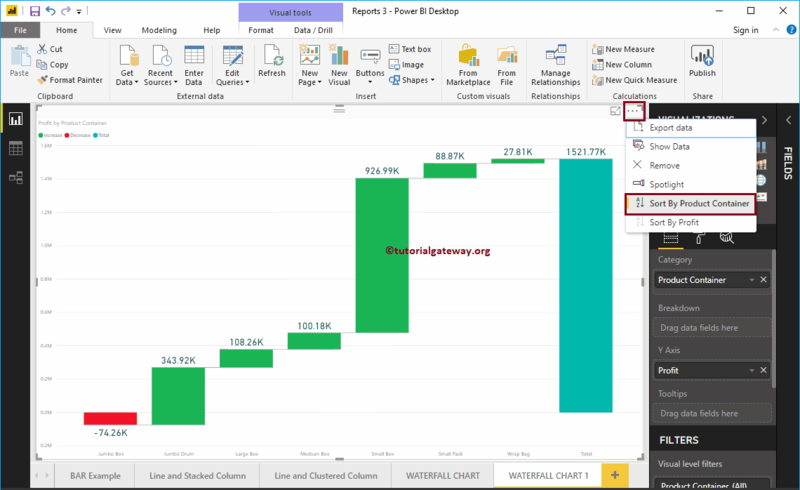 This will automatically convert a Column Chart into a Waterfall Chart. Next, we added the Data Labels so that you can see the increased or decreased profit amount. Under the sentiment colors, you can change these bar colors as well. 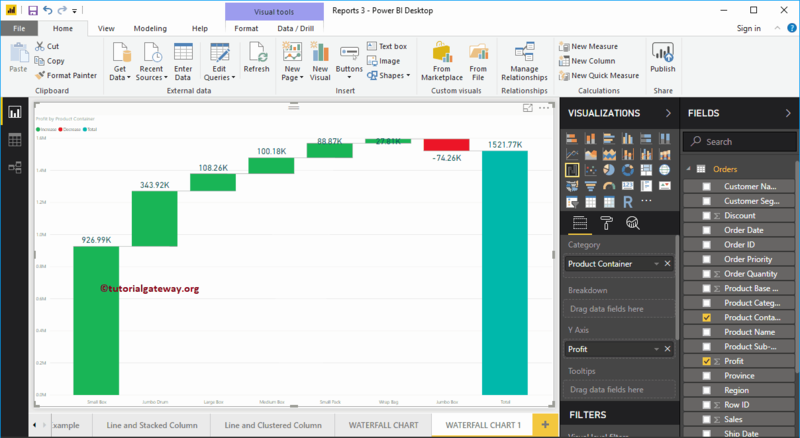 First, click on the Waterfall Chart under the Visualization section. 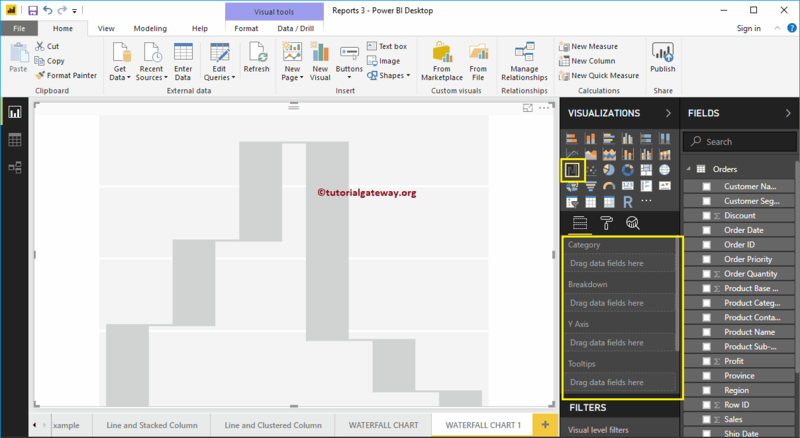 This will automatically create a Waterfall Chart with dummy data as shown in below screenshot. Category: Please specify the Column that divides chart (Horizontal axis column). Breakdown: Specify the Column that will sub-divide the Details data. Y Axis: Please specify the Metric Column that represent the Vertical Axis. Let me drag the Profit from Fields section to Y Axis section. Next, let me add Product Container to Category section. You can do this by dragging Product Container to Category section, or simply check mark the Product Container column. Next, we added the Data Labels so that you can see the increased profit. 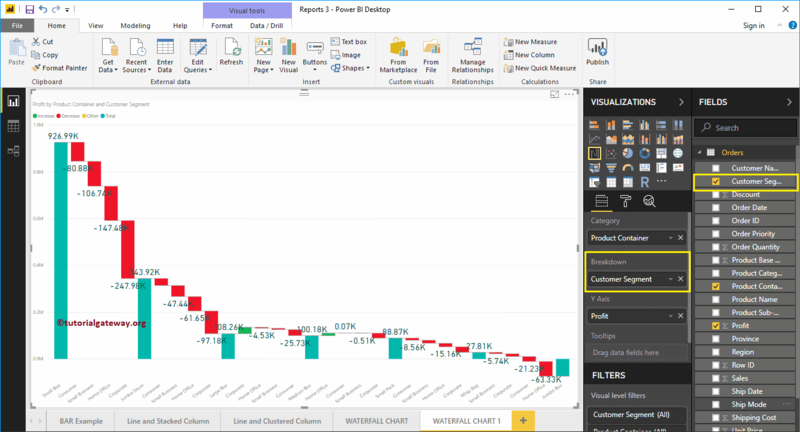 From the above screenshot, you can see that the Waterfall chart is sorted by Profit in descending order. So, let me sort the chart by Profit in ascending order. To do this, click on the … (3 dots) on top right corner, and select the Left corner of the Sort By Profit option as we shown below. This time we sorted the data by Product Container in descending order. This time we sorted the data by Product Container in ascending order. Let me add Customer Segment to the Breakdown section. And you can see from the below screenshot,. 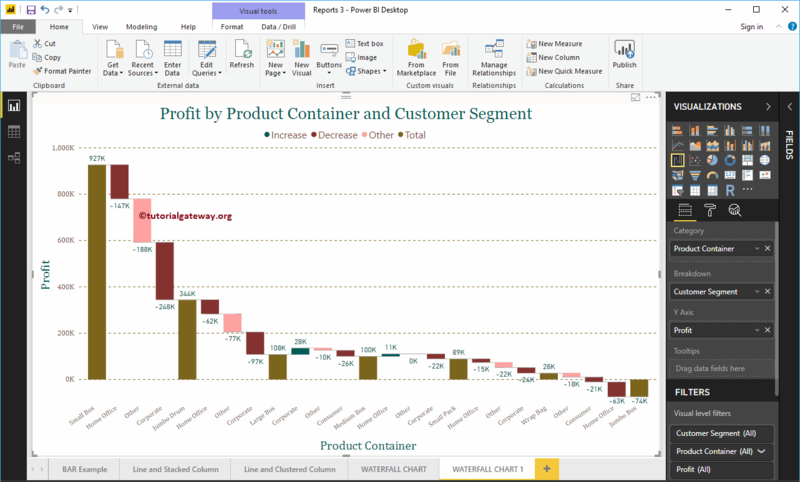 waterfall chart has further divided based on the Customer Segment. 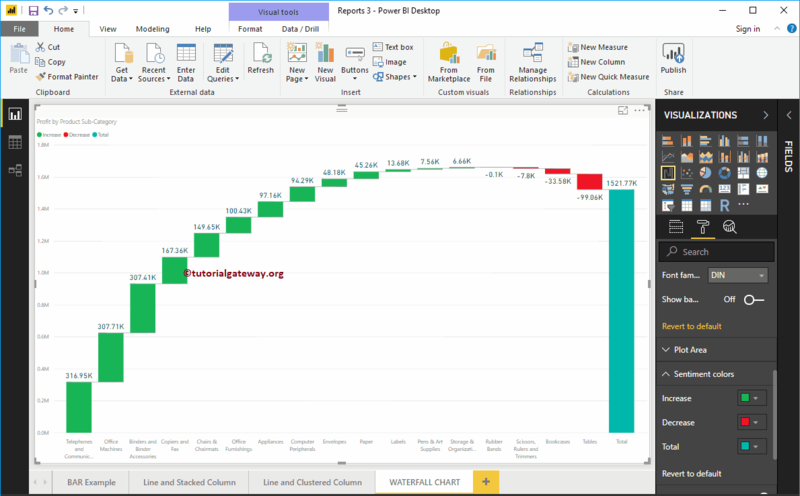 NOTE: I suggest you to refer Format Waterfall Chart article to understand the formatting options.